FC72 in the Hyperflow of History. Covered in multimedia lecture #7153. The Later Middle Ages were a time of turmoil for the Catholic Church, as the growing power of kings and popes in the High Middle Ages led to rising tensions over various forms of authority and jurisdiction. Although they had largely won their struggle with the emperors in Germany, the popes were less successful in dealing with the rising power of the French and English monarchies. Problems centered on control of two things: the local clergy and Church taxes. The popes had a habit of rewarding their Italian supporters with church offices all across Europe. Both common people and local native clergy resented this and looked to the king for help against these Italian clergy. As a result, the popes found much of their own local clergy aligned against them and with the kings. Meanwhile, during their struggle with the Holy Roman Empire, the popes had granted kings the right to collect church taxes in return for aid against the German rulers, justifying their actions by declaring these wars crusades. But when war broke out in 1294 between France and England, both countries' kings used the precedent of collecting church taxes for the popes' wars to justify collecting church taxes for their own wars. When Pope Boniface VIII refused to let Philip IV of France do this, Philip and his agent, Nogaret, planned to subject the pope to the inquisition for crimes he allegedly had committed. When this plan failed, Nogaret and the pope's enemies in Rome kidnapped Boniface. Although he was soon rescued by loyal followers, he died a few days later. The College of Cardinals, probably feeling pressure from the highhanded acts of the French king and his agents, elected a Frenchman, Clement V, as the new pope. Clement set out for Rome, but never made it there, stopping at Avignon, a papal city close to French territory. For the next 70 years (1309-77), the popes, all of who were French born, stayed in Avignon. During this period (known as the Babylonian Captivity after the 70 years of captivity the Old Testament Jews had spent in Babylon), the popes came under increasing criticism for being corrupt and under the thumb of the French kings. Whatever the truth of these charges, the Avignon papacy symbolized the decline of the medieval papacy. The kings' increasing ability to claim the loyalty of the local clergy and to collect church taxes helped create several quasi-national churches that officially were part of the Roman Catholic Church but were increasingly under royal control. 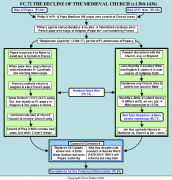 The Babylonian Captivity, along with the Hundred Years War then going on, also triggered challenges to papal authority from two other directions: church councils and popular heresies. The resentment that the Babylonian Captivity aroused against the Church grew worse when the popes tried to move back to Rome. By the 1370's, the turmoil of the Hundred Years War was making life at Avignon increasingly dangerous. The capture and ransoming of Pope Innocent VI by a company of English mercenaries (who had little use for a French pope, anyway) convinced Pope Gregory XI to move to Rome. However, at this time, Rome was a more dangerous place to live in during times of "peace" than France was during war. It took Gregory three attempts to get into Rome, and once he got in, he quickly decided he wanted to leave and return to Avignon. Unfortunately, Gregory died before he could get out. For the first time in 70 years, Rome was the scene of a papal election, and the Roman mob clamored outside for an Italian pope. Under such pressure, the College of Cardinals elected an Italian, Urban VI, as the next pope. Unfortunately, Urban was something of a violent and bigoted man whose actions drove all but three cardinals back to Avignon where they elected a second pope. Thus began the Great Schism, a period of turmoil when the Church was divided in its loyalty between two lines of popes, one French and one Italian. To no one's surprise, each pope refused to recognize the other and even excommunicated him and his followers. This led to enormous anxiety among devout Christians, who found themselves supposedly excommunicated by one pope or the other. With neither pope willing to resign, something had to be done. The most popular suggestion was a general church council such as the ones summoned to solve major disputes in the past. There were several problems with this solution. First of all, popes traditionally called such councils, and neither pope was willing to call such a council. This made the legality of such a council questionable if not called by at least one pope. Second, different rulers in Europe supported particular popes, largely for political reasons. Such political divisions made it almost impossible to get people to agree on the site of a council, not to mention the deeper issues involved. Finally, the whole issue of a Church council raised the question: if a council could depose the pope, who was the real head of the Church? This was a question that lingered on long after the Great Schism had faded away. At last, a council was called at Pisa, Italy in 1409. It deposed the two rival popes and elected a third. Unfortunately, neither original pope recognized the council's power to depose a pope, so now the Church had three popes. However, by this time, people were committed to the idea of a church council, and another one was called at Constance, Switzerland. All three popes were deposed, and a fourth, Martin V, was elected. Although one of the deposed popes held on in Avignon until 1429, the Great Schism ended here. Its effects did not, because it caused people all over Western Europe to question the authority of the pope in the Church. Although a single pope once again ruled the Church, his reputation and authority were permanently undermined. Besides discontent within the ranks of the clergy, the Babylonian Captivity also caused popular discontent in the form of heresies. During the Hundred Years War, the French popes at Avignon were especially unpopular in England, and it was here that the first of these heresies emerged. Its leader was an Oxford scholar, John Wycliffe (called Wicked Life by his enemies). His main point was that the Bible is the sole source of religious truth, and therefore anything not in the Bible did not belong in the Christian faith or practice. In Wycliffe's view this meant that such mainstays of Catholic practice as confession, penance, pilgrimages, veneration of saintly relics, excommunication, Church ownership of property, and the gap in status between the clergy and laity (non-clergy) should all be abolished since there was no mention of them in the Bible. Possibly Wycliffe's most revolutionary act was translating the Latin Vulgate Bible into English so the common people could read it for themselves. Such an act made it much more difficult for the Church to keep its monopoly on religious truth. It also led to a variety of interpretations of the Bible by some of Wycliffe's followers known as Lollards (meaning mumblers or babblers). The more radical Lollards did such things as chopping up images of saints for firewood, holding mock masses, and eating communion bread with onions to show it was no different from regular bread. Because of England's hostility to the French and the popes at Avignon, initial reaction to the Lollards was mild until the Wat Tyler Rebellion broke out in 1381. After that, the authorities were much sterner with the heresy, burning some fifty Lollards at the stake over the next 40 years. Wycliffe himself was mildly reprimanded. He died peacefully in 1384. However, his heresy did not. Among the Lollards were a number of influential people, including Queen Anne, who came from Bohemia (modern Czech Republic). She sent several copies of Wycliffe's writings home where the heresy caught on. In addition to this heresy, there was also a growing national consciousness among the Bohemians aimed mainly against the German ruling class. This combination of heresy and a growing national consciousness would prove to be a devastating force in the events about to unfold. Public sermons in the streets of Prague criticized Church corruption while translators produced 33 handwritten copies of the Bible in the Czech language. At the center of all this turmoil was Jan Hus, a popular preacher and professor who was heavily influenced by Wycliffe. Hus' writing and preaching stirred up more and more anti-church and anti-German feeling. This led to a condemnation of Hus' works, which in turn provoked a wave of riots and protests across Bohemia. Faced with the possibility of a full-scale rebellion against the Church, the pope and the Council of Constance summoned Hus, under promise of a safe conduct, to defend his views. The council unwisely went back on its word, had Hus declared a heretic, and burned him at the stake. Rather than depriving the Bohemians of a leader, this act provided them with a martyr around whom they could rally. The resulting Hussite Wars (1420-36) showed how powerful a combination nationalist feeling and popular piety could be. The Church launched five crusades against the Hussites, all of them dismal failures. The Hussites combined new firearms technology with the ancient Bohemian tactic of making circular walls of wagons ( wagenburgs) to create a seemingly invincible army. Hussite armies even invaded Germany, plundering at will all the way to the Baltic Sea. By 1433, the Church had had enough and opened negotiations with the Hussites to keep them from spreading their heresy across Europe. The Hussites, not ready for a complete break with the Catholic Church that had led the faith for centuries, were also willing to compromise. The Church allowed certain religious liberties in return for the Hussites' allegiance to the Church. Although the Hussites had returned to the Church, their importance lived on. For, just across the border in Saxony some 85 years later, another reformer by the name of Martin Luther would lead another revolt against the Church, raising many of the same points Wycliffe and the Hussites had raised. Only this time, the break, known as the Protestant Reformation, would be permanent and alter the course of European and world history.